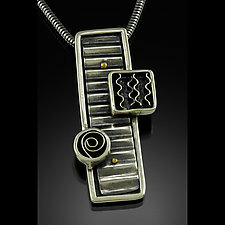 "Creating a piece that is subtle, with depth and texture, is gratifying to me. Inviting the eye within to discover different elements that are simple yet complex, industrial yet natural, I find very intriguing. " 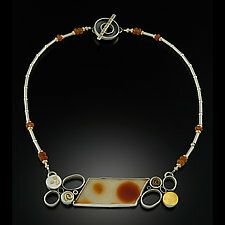 The inspiration for Kim Wilson's jewelry comes from exploring life's surroundings. Whether it is textures in nature, geometric shapes, or feelings from within, all are a stage of the creative process. Since 2000, Wilson has been designing small wearable sculptures. Implementing her background in floral design, she incorporates her own natural yet contemporary interpretation in each work of art. It is rare that Wilson's vision of a piece starts on paper; instead, she prefers to let the piece evolve during the construction process. 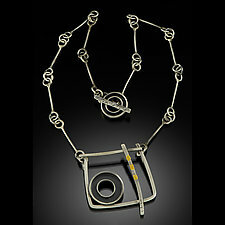 Her hand-fabricated pieces are created using sterling silver, high karat gold, and stones. The metals are treated with surface techniques such as forging, roller printing, and patinating. Because some pieces are more complex in construction, she uses both hot and cold connections. Kim Wilson studied metals and jewelry construction at Milwaukee Area Technical College (MATC) and Terri McCarthy Studios in Grafton, WI. She has participated in various workshops by well-known instructors, including Todd Reed, Andy Cooperman, Leah Hardy, and Jan Harrell.